My kitchen and cookbook collection all boxed up! I moved last Sunday. I'm really excited about my new place. Beautiful kitchen with beautiful countertops. Plenty of room to roll out dough without leaving the kitchen to find a larger work surface. Woohoo! But you might have noticed that I haven't posted a recipe lately. Well, that's because a lot of my kitchen is still in boxes! And not only the KitchenAid stand mixer. I can't even find my silverware! I know they're somewhere, not lost forever, but until I get through my boxes, I'll be living off plastic forks, spoons, and knives. Perhaps the most amazing thing of all is my cookbook collection. 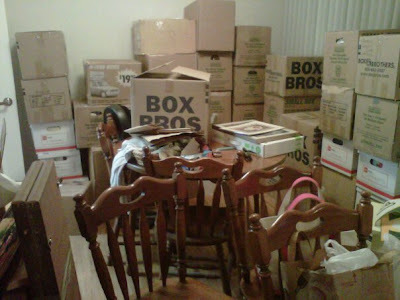 It took 12 boxes and many hours to pack them up for the move. 12!!!!!!!! And since I haven't attached my bookcases to the walls yet for earthquake safety (ah, the awesomeness of living in California does come with a price), I've been holding off on putting the books onto the shelves. I miss my cookbooks. So much! I know that when I finally get to take them out, I'll be kissing each one on the forehead, er, cover. Anyways, wanted to update you on the reason I haven't baked in awhile. All of my favorite things are inaccessible. I'll be posting plenty soon. I've got a sweet kugel recipe I'm dying to share with you. Wish me luck with the unpacking! OMG, I am overwhelmed just look at that picture!